If you are an AIBS member, please log in by clicking the "login" hyperlink up in the right corner to access the membership benefits and BioScience. 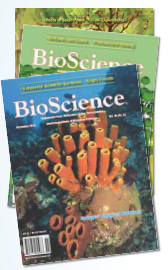 If you are not a member and would like to access BioScience, please click here to be redirected to our publishers website. If you are not already a member, please join us today.